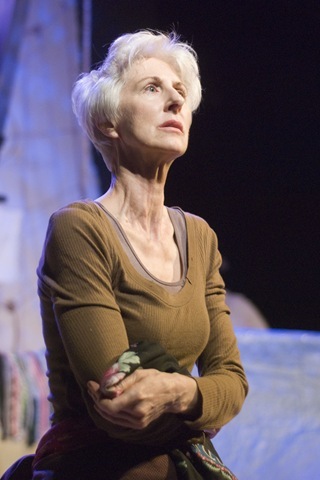 What is Hecuba to us or we to Hecuba? The obvious answer could lie in the present-day struggles of women eking out an existence in war torn camps for displaced persons. Bare Boned Theatre’s playwrights Rebekah Walendzak and Jeffrey Bouthiette have attempted to mesh the excruciating suffering of contemporary women in the midst of war with Euripides’ classic tale of a war-devastated queen. Unfortunately, what they have gained may be just equal with what they have lost in the process. Furthermore, substantial lack of clarity in some scenes may ruin the theatrical experience for those unacquainted with the original work. 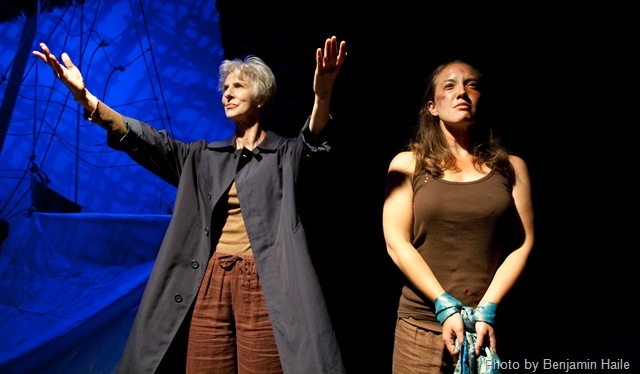 On the plus side, the general shift in the play, from Hecuba surrounded by her attending women to the women being refugees in a contemporary camp, strengthens the Greek choral moments of the original play. Directed by Bouthiette, the unity of The Hecubae’s all-women cast is resilient and undeniable. Moments of song evoke the greatest power and hope for their survival. One Greek choral moment in the beginning, however, must be thoroughly revised for greater clarity. The choral performance of Hecuba’s youngest child being killed by a trusted friend and ally is far too confusing. And the use of a woven mat to represent her child is far too amateur for this production. 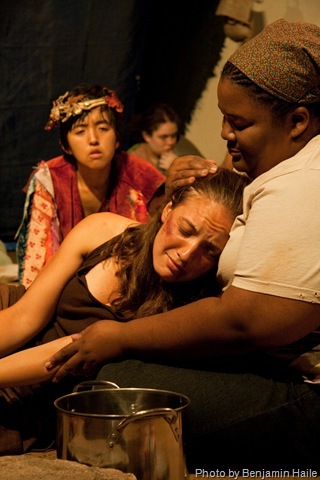 Bare Bone’s modernization of Euripides becomes more effective with smaller touches—such as when a soldier with ruined legs, mounted on a makeshift cart, wheels onstage to tell Hecuba the latest bad news. The scene where Odysseus uses graphs to explain how Hecuba’s daughter will be sacrificed ranks as a near-perfect portrayal of rationalized brutality. 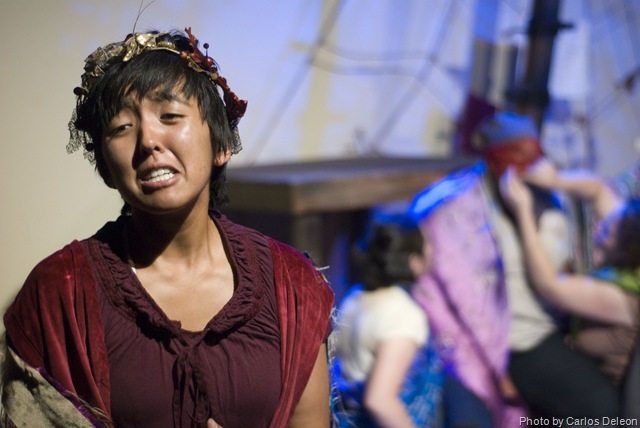 Casting the young Samantha Garcia as Hecuba follows Bare Boned Theatre’s philosophy of non-traditional casting, yet Garcia’s command of Euripides’ poetic language conveys her Hecuba as noble as well as fallen. How sad it is, then, when this adaptation splits scenes in such a way that poetry and dramatic tension are lost. Then contemporary travesties only obscure, instead of enlighten, Euripides’ words and drain away the potential for Hecuba to stand for all women in war. It’s back to the drawing board for the playwrights. They must strive once more, not only to sustain a dramatic arc through crucial scene changes between the ancient and modern camps, but also to personalize and particularize the suffering of modern women in war for a truly meaningful adaptation. In general, clichéd representations of women’s suffering or victimization do not move people. People can feel sorry for the women represented in such a drama, but they cannot become emotionally engaged with their suffering as audiences should be. Euripides knew how to make his deeply sexist, predominantly male Greek audience identify with Hecuba–with her powerlessness, her outrage, and her descent into dehumanizing violence. He could pull them from their positions of male privilege and plunge them into the profound depths of loss and despair that women in war know. We should be so lucky to have the same done to us.